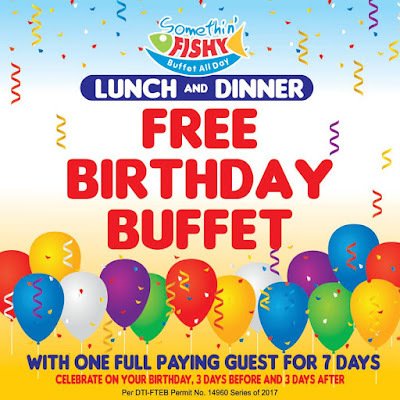 Celebrate your birthday at Somethin' Fishy with their FREE Birthday Treat! Dine with just one (1) Full-paying guest for 7 Days, Lunch and Dinner! FREE buffet for Birthday Celebrators who will celebrate and dine in with one (1) paying adult ON ACTUAL BIRTHDAY, THREE (3) DAYS BEFORE AND THREE (3) DAYS AFTER. To claim, Celebrator must present to any of our dining personnel a valid document with proof of birth date, (Birth Certificate, SSS ID, TIN ID, Voter’s ID, Passport, Driver’s License, PRC License, AFP/Military ID). Celebrator must also completely fill up the information sheet. Promo is not valid with any other existing promotions. Promo not valid on Valentine’s Day, Mother’s Day and Father’s Day. Promo will run from January 1, 2018 to December 31, 2018. *For Refillable/Interchangeable/Bottomless drinks just add P60. *Refillable/Interchangeable/Bottomless Juices and Sodas included. *Refillable/Interchangeable/Bottomless Shakes, Juices, and Sodas included. For inquiries and reservations, call us at 421-2121 / 421-6412 / 421-6413 / 0917-8223283. *Prices may change without prior notice.